I am convinced that our bodies often tell us what nutrients they need. One just needs to listen carefully. For instance, in winter I often feel like eating tinned tuna. The craving is so big that I eat it straight out of the tin. The whole tin. It makes me almost as happy as eating a whole bar of chocolate at other times (oh oh, not sure what my body is trying to tell me at those times...). I am sure my body needs something that it knows can be found in tuna. The other day, I bought 2 pounds of barley grains and left the bag on the kitchen counter. An Indian friend of mine saw it and commented that she loves barley in summer because it has cooling properties, under the concept of the Chinese Yin (Cool) and Yang (Hot). In fact, barley is being used for cooling teas and other beverages in the Far East. With that in mind, I just cooked a pot of barley, thinking that I'd make a light lunch salad out of it the next day. And so I did. I added some freshly cooked kidney beans, to add some vegetarian proteins to the salad. 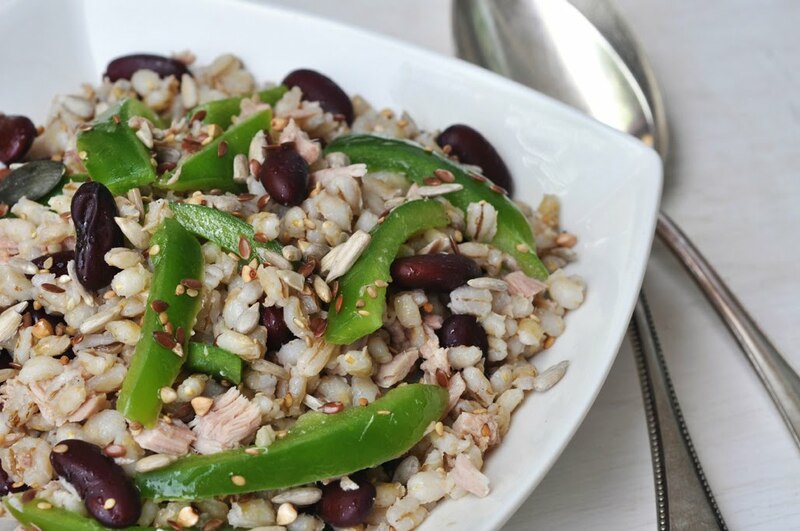 Kidney beans have a high fiber content that prevents blood sugar levels from rising too rapidly after a meal. I added some canned tuna, which is full of Vitamin B and omega 3 essential fats. Now we just needed some raw veggies in it: I simply chopped a green bell peppers, rich in vitamin A and C. Dressed the whole salad with some lemon juice and olive oil and sprinkled some toasted seeds. That's it. A perfect summer salad, great for lunches or light dinners. Easy to be made in advance. Definitely a keeper!! Soak kidney beans for at least 4 hours, preferably overnight. Drain. Cook in fresh, slightly salted water until tender, about 25 minutes. Drain and rinse. Cook the barley in 3 cups of slightly salted water until tender and chewy, about 30 to 40 minutes. Drain and rinse. If you want to shorten the cooking time, soak the barley grains overnight in water. Drain and cook in fresh water. Deseed and devein the bell peppers. Cut them into thin strips, each about 1 inch long. In a small bowl, combine all ingredients for the dressing. 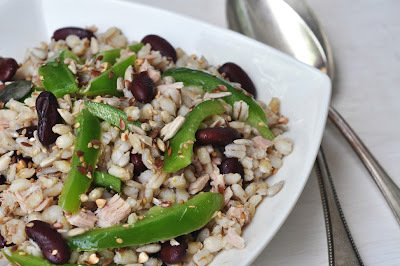 Combine cooked barley, kidney beans and bell peppers in a salad bowl. Add the tuna chunks. Pour the dressing over the salad and mix until salad ingredients and dressing are well mixed. Sprinkle the toasted seeds over the salad. Serve at room temperature.